The plan was simple. We wanted to see as much of the coastline of South Africa as possible, as we were emigrating to Europe. Having shipped our belongings, we closed the door of the house for the last time and handed over the keys to the new tenants. There was now no turning back and we had three weeks until our flight from Johannesburg International Airport. Armed with our trusty white VW Golf (no aircon), a handful of maps, a bag of clothes and some cash, we decided to head west. Firstly because we had never been that way to the coast before and also following our instinct to “Go west, young man”… Here follows our diary of the trip. We hit the road fairly late, heading towards Kimberley, about 400 km from Johannesburg. We passed by quite a few open mines and the townships supporting them. The road was not, as expected, a highway, so progress was sedate, but traffic was light and it felt good to leave the bustle of the city behind us. We soon settled into “holiday mode” and “what will be, will be”. Arriving in Kimberley after dark therefore didn’t phase us, although it was clearly not part of the ‘plan’. Doing a quick lap of the town we decided to book a room at the Protea hotel, and settled in for our first night ‘on-the-road’. We ain’t goin’ nowhere … decide to stay another day. Lovely and relaxed atmosphere. We visit the outdoor ‘dune’ restaurants, closed but interesting to see, and the local bird life, thousands of gannets on Bird Island. End of the day is the perfect time for a barbecue. Red wine, chicken and sunset round off a great day of soaking up the sunshine from the deck and watching the Atlantic doing its thing against the rocks. Head inland again. Towards the vineyards. Lots of towns dotted about, with immense valleys covered in grapes… Land in a small town called Riebeek-West. Very arty feel and a great guesthouse, actually an antiques store doubling as a restaurant. You can buy the lampshades or the chair you’re sitting on. But settle the tab first… The wine is good… Really good. Creaky bed with no springs in the middle, ancient house and even an outhouse out back (not in use). Can feel the creative vibe in the town, art studios and wine making. Time to go. Take the long road, even though we are a stone’s throw from Cape Town. The road winds through immense valleys, towering cliffs on both sides. A thousand km’s ago it was flat and featureless, now the mountains are simply breathtaking. The Hex River Valley must rate as one of the most beautiful gorges. I call it a gorge because the road seems to carve through the mountains with steep cliffs on each side almost leaning in towards you. Finally we ease into Paarl. Famous for its wines and a rocky outcrop that shines like a pearl (paarl) when the sun catches it right. Seems to be a bustling little town after all the sleepy villages we’ve passed through. Book a room in a guesthouse (probably one of the worst on our trip, but cheap enough) and decide that today is laundry day… Take a drive to the ‘rock’, very misty and chilly, but quiet and peaceful. Keep the room for another night in order to explore the region. That way our laundry can get done and we won’t have to worry about finding another room if we are going to stay in the area anyway. We ‘do’ Cape Town and surrounds. Having been there before, its mystery has disappeared, but we do manage to find a sign for Atlantis next to what is basically a township set among the trees on some road. Not exactly inspiring… Lunch in Franschhoek. Must stand out from the rest as being the most picturesque. Nice main road with plenty of choice in lunchrooms. Come away from the day with the feeling that most of the towns here are modelled along the same lines, farming communities, wineries and little more besides guesthouses. Time to move back to the coast. Enjoying the trip so far… Nice that we have no idea what to expect. Decide to head straight inland to the highway. Rolling hills with only wind pumps dotted around the place. Farm workers herding sheep down the road, causing chaos. Can’t help but smile. Pass through Swellendam, nice old town set against the hills. Beautiful setting, but with the world’s highest concentration of guesthouses, surely. 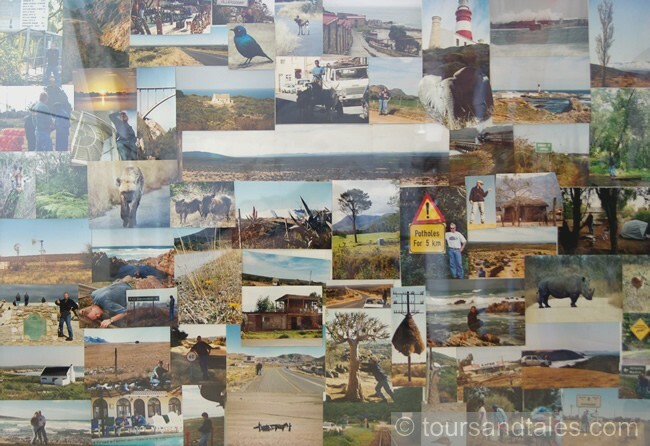 Mossel bay beckons… the road seems to stretch longer and longer, we pass mines, townships and huge cattle farms, the countryside flattening out, but finally we enter the main road without even realising it. The Cape has the best tourism office in the country in our opinion. Easy to find, friendly people and tons of brochures. The back seat of the car is filling up and I’m certain it’s affecting our fuel consumption… We settle on a quaint old guesthouse, really old and a great view of the huge bay. Take a walk through the hills and visit the cultural centre. Pizza for dinner, with sea spray in the background. Don’t you just love the sea? Set out for the coast and George/Knysna. Garden route is stunning. Check in to a tiny room in the ‘Caboose’ hotel, like a railway cabin. Find the railway station and board the Outeniqua Choo-Tjoe, an old steam train running between Knysna and George. Awesome! Cutting right through the forests of Knysna and along the sea. Lovely to see an old engine at work, how they build steam and take a run-up in order to crest a hill, almost slowing to a crawl at the top and then…made it, and free-wheel down the other side. Great stuff, what fun they must have had a hundred years ago. A bus delivers us back to Knysna and we stop at an oyster farm for a bite to eat. The most delicious, fresh oysters are grown right there and the deck of the restaurant provides a beautiful view of the lagoon. The restaurant at the ‘Knysna heads’ also deserves a mention for an excellent setting and great food. From Knysna we follow the main road to Port Elizabeth, making excursions en route to explore a dirt track or some minor road leading into the trees. It’s raining, or rather drizzling and it’s perfect mood and setting as the mist hangs in the trees, giving the forests a sense of mystery. Once again, off the beaten track, we are alone, sliding our little car down the tracks, through the streams at the bottom of the valley and up the other side. Thanks to some nifty navigation we always find the road again and head off in search of the next side road. We pass through Plettenberg bay, and head towards St. Francis bay. Somehow everyone raves about this place, with it’s canals and Cape Dutch style thatch roofed houses, but the drive there is flat and barren and the place seems to have an artificial feel. Once you get to the sea though everything is cool, and you quickly forgive anything. Get to P.E. latish, find another tiny room and have a steak before catching some shuteye. Getting to like this nomadic existence. Just point the car in the right direction and see where you end up… Always new, always different. Better not to have a plan, just a rough idea of the mileage we need to cover that day. Today it’s East London. Not too far, so we find the alternative route again. Can’t believe the beauty of this country and the diversity. Never stops changing… Grahamstown is quite interesting, old town, lot of history and older buildings. King Williamstown less so, masses of people and not much in the way of tourist amenities it seems. So many of these places deserve a second visit as we have little time and a lot of miles to do. Hogsback is lying in the snow, lovely little place, hardly a town, with houses scattered amongst the pine trees, and a beautiful view of the outstretched valley at the other side. East London has a nice vibe to it, very laid back, although the size of a city. Seem to do their own thing in relation to the rest of the country, like the land that time forgot. It’s there, but nobody’s noticed. Relaxing evening at the pizzeria right over the rocks, and the sound of waves crashing coming through the window of the hotel room. 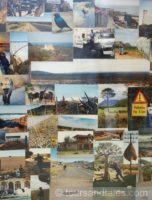 Heard a lot of stories about the Transkei. Robberies and stuff, not very safe, don’t stray from the main road, etc. Find it very rural. Seems obvious, but you never really think about it. People walking in the road, heading who knows where, permanent road works all over the place, thatch huts all over the hillsides and cows grazing right next to the road. On a whim we turn off towards Coffee bay, a road stretching 80 km straight to the sea. Will have to return along this to get back to the main road. But we’ve never been here before… Feel very uncomfortable because of all the stares from the locals, like we don’t belong here. The car even gets hit by a stone, thrown by a child in school uniform … But Coffee Bay is simply unbelievable, probably due to the seclusion, but untouched and awesome rough crags overlooking the sea. Stay a little longer than planned and urge the car to the highway and on towards Margate, where we find the first place with rates posted and call it a night. What a day… it seemed like the ‘wild Africa’ of old, where explorers first found a country pristine and wild and untouched. Stunning to see. Spend the morning meandering along the South Coast, on the old road. Scenery changes again, with banana leaves making way for sugar cane. We pass Durban by and continue, trying to follow the old roads that pass through the towns. More sugar cane fields, and rolling hills. We break our unwritten rule and head to St. Lucia, despite having been there before. On our balcony overlooking the estuary, we light the barbecue and relax to the peaceful sounds of the evening. Truly an amazing place, can understand why it’s the fisherman’s best-kept secret…. Time to go… We spot a leopard hidden in the foliage of a tree as we head for the southernmost gate. First time to spot a leopard, very shy animals, and feel that warm glow again. An eagle in the treetops, just in binocular range rounds off a great couple of days. It never seems long enough… feel a strong urge to stay. Driving along we rethink our trip. It seemed really quick in retrospect. We arrive in Johannesburg in the afternoon after another slow drive, trying to prolong the moments… Head to the car dealer and hand over the car. Give it a pat on the roof in parting. It served us well. Many miles of tarmac and many experiences under it wheels…. Our lift arrives to take us to the airport, and it seems so final. We’re unable to drive there ourselves any more… Like our freedom has been snatched from us. After a long wait at the airport, we are finally allowed to board the ‘plane. I turn and take one last breath… I’m going to miss that smell.